Frosted windows? Like they're all fogged up from some heavy workouts going on? Sorry, my mind is in subspace right now. you know, they have dark sheet plastic film like sunglasses. Polarizing film I think it's called. If you used that in combination with some silouhette cutouts of pilots you would get a good effect I think. Moongrim wrote: Frosted windows? Like they're all fogged up from some heavy workouts going on? Well, a gym might be nice on some of those long surveying missions to the Gamma Quadrant. I know I would want one. Though I imagine that Worf and Dax have other ways to burn calories in their downtime. I am talking about Klingon martial arts of course. Anyway, I think I will just lightly spray the windows from the back side with a yellow/tan paint, then light them with either yellow or while LEDs. Worked fine on my Maquis ship. The studio model seems to have just had black windows. I don't think those would be too lightable. The Eye of Error wrote: you know, they have dark sheet plastic film like sunglasses. Polarizing film I think it's called. Great idea. I will look into it. RogueWolf wrote: One month to deadline! Any Progress? I have been stalled for about two weeks now for various reasons. But I should be able to get a fair bit done this weekend. I will try and post an update Sunday. Sorry guys, but I am not going to have this done in time. Despite being what I thought was a simple project, I hit quite a few setbacks. Most recently I managed to melt/distort a small part of the model, plus I broke the very tiny wires leading to the "sensor bar". As for the broken sensor bar, I decided to just ditch it and make this the Rio Grande. 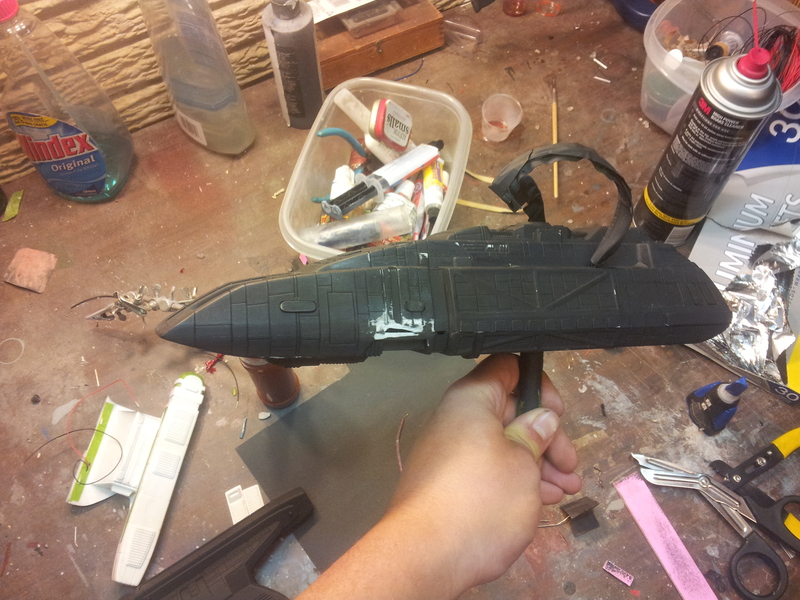 I have made some progress since these pictures, I do have most of the model in primer. I hope to be able to patch up a few small problems and get a base coat of paint on this Wednesday. Unfortunately my next two weekends are shot, so I have no idea when I will be able to finish it. The contest was extended to the end of June. So you still have 4 weeks if you think you can make it.